You can visit us as often as you like as a National Forest Adventure Farm Member so you’ll always have somewhere to bring the children whatever the weather. Also with a changing programme of seasonal events there is always something new to see and do. 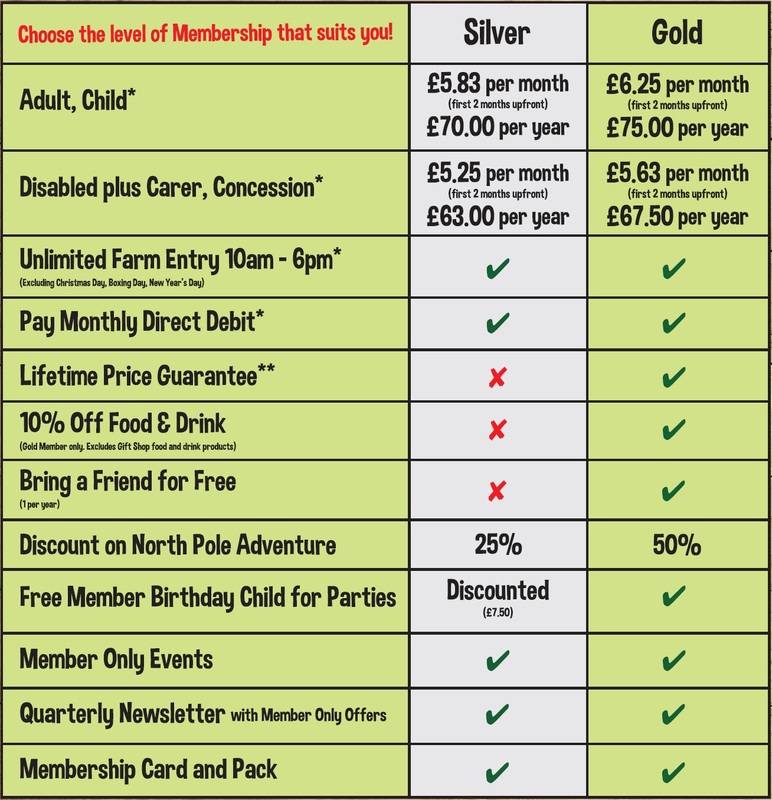 Choose from 2 Membership packages, Gold and Silver, and pay annually or monthly via Direct Debit – we just ask for 2 months payment upfront. See below for the benefits of each Membership tier. Select your preferred Membership tier and payment method, then Join Now. Get Gold Membership for only 42p extra per person per month! Click to table to enlarge. *Minimum 12 months Membership. First 2 months payment upfront. **Applies when annual Membership is renewed before the expiry date or monthly payments are continued without a break after 12 months. Proof of disability documentation is required. Memberships can be purchased online either at home or at the Adventure Farm. You’ll need your bank details to set up a Direct Debit payment. We also offer Membership Gift Vouchers. We won’t put up your Gold Membership price for as long as you continue your Membership! Please note that you must present your card to gain free entry. Sorry, but without it you will be asked to pay. Lost cards incur a £5 administration charge. If you wish to upgrade to Membership on the day of your visit the cost of you tickets will be returned to you in Scarecrow Joe Restaurant Vouchers.